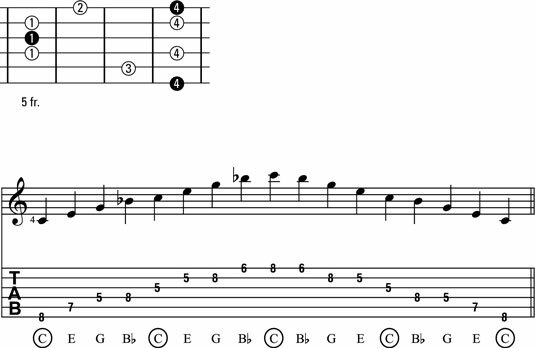 A guitar arpeggio is a chord whose notes are played one at a time instead of simultaneously. It’s sort of the exploded view of a chord. Seventh chords sound richer and more complex than basic major and minor chords, and they’re prevalent in many types of music, including jazz, pop, classical, rock, and blues. You can derive a dominant seventh chord in different ways, but here’s how you should do it for now: Start with a major scale and play 1, 3, 5, b7. For example, in the key of C, if you play C, E, G, and Bb, you produce a C dominant seventh chord, or C7 for short. As you work through the arpeggio exercises, play each one from low to high, slowly, loudly, and deliberately at first. After you’ve practiced an exercise a few times, play it faster and lighter. No matter how you’re playing, however, be sure to maintain your starting tempo and dynamic level (loudness) throughout the arpeggio. The following figure shows an A dominant seventh chord arpeggio in 5th position in both a neck diagram and in music and tab format. The out-of-position notes (notes outside the four-fret span of the position) for this pattern occur on the 6th and 1st strings. As a warm-up, jump from playing 1-4-1-4 on the 6th string to 1-4-1-4 on the 1st string, and back again. Note that your fingers naturally curl up at the 1st string and extend out at the 6th, so this is a good flexing exercise as well as a stretching one for your fingers. Here’s an exercise in rhythm. It’s in the key of B in 7th position. Try accenting the first and fifth notes of each measure, as they fall on the strong beats in 4/4 (beats 1 and 3). 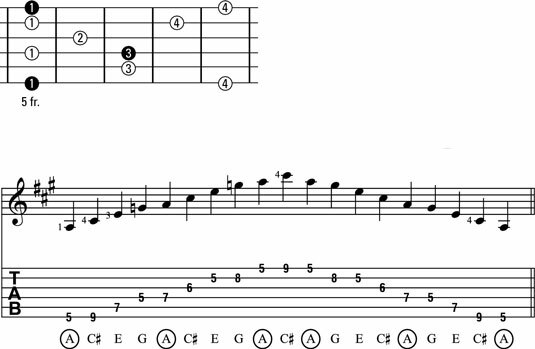 Following is the neck diagram and corresponding music and tab for dominant seventh chord arpeggio pattern #2 in the key of C. The first three notes of the pattern are all on different strings, requiring a bit of right-hand practice if you’re playing with a pick. Consider switching to fingerstyle for this exercise, at least for a while. To make this pattern a bit easier, flatten your 1st finger in a mini-barre (a partial barre that covers just two or three strings) to play the consecutive notes on the 3rd and 2nd strings, which both occur at the same fret (the 5th). This technique is especially helpful if you want to create a more legato (smooth and connected) sound between the notes. When you’re ready, try the following exercise in the key of A in 2nd position. Playing dominant seventh chord arpeggios in triplets is a great way to fill out the chords in a swing of shuffle blues, so work on really digging into the notes here with feeling.